A flyover is a strange place to make a home but it is under one where Ruslan bin Sidek has lived for the past 15 years. Since discovering it in 1998, the place has been his shelter as well as his sanctuary. He finds freedom in the wide open space and proximity to the sea – a much appreciated contrast to his confined past. Ruslan hasn’t had an easy lease on life. 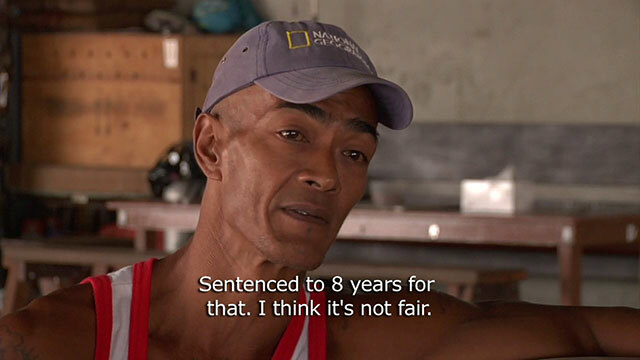 The first time he ended up in prison, it was for breaking and entering, a crime he maintains, he was wrongfully imprisoned for. It’s hard to join the urban rat race when you carry the stigma of being an ex-convict, especially one with tattoos and a low level of education. So left on the fringes of society, he then started abusing drugs, which accounts for his second time in jail. With the help of Pertapis Halfway House, the support of his caretaker, Ridzal Taufiq, and a resilient spirit, he’s turned his life around and bounced back. No longer is Ruslan ruled by anger, rather he is a vision of zen and tranquility as he describes his self-made home, his past and his regrets. Rehab with Ridzal has taught him to accept responsibility for his actions and that in turn, has given him control over his demons. He’s in charge of his mind, body and future, fuelled by irrepressible inner strength and positivity. It’s a second chance he isn’t going to waste, whether or not society accepts him with open arms. Just one more! Next, watch Going Home: Just when life beat him down, he found home, hope and family.